For 25 years, Washington, D.C., sports fans have felt like the odds never seem to be in their favor. Case in point, these fans found themselves in a situation where their beloved Nationals, Capitals and Wizards were all playing on the same day and all starting within an hour (7:05 p.m., 7:30 p.m. and 8 p.m.) of one another. You get the picture — it was a big night for D.C. sports fans. But who exactly hurt these folks so bad that they were anxious a whole 12 (possibly 24) hours ahead of game time? Well, their favorite teams. The last team to bring home the chip was the Washington football team in 1992. But since then, there has been no new hardware among the Major Four. Brian Dumoulin and Ron Hainsey of the Pittsburgh Penguins go after the puck against Justin Williams (No. 14) of the Washington Capitals in the third period of Game 7 of the Eastern Conference second round during the 2017 NHL Stanley Cup playoffs at Verizon Center on May 10 in Washington, D.C. Since the Capitals were swept by the Detroit Red Wings in their only Stanley Cup finals appearance in 1998, the team has had 18 seasons to get back to the championship series. They missed the playoffs six times and have played in six quarterfinals and six semifinals. The 2004-05 season was wiped out by the lockout. In the past two seasons, the Capitals won the Presidents’ Trophy, awarded to the team with the best-regular season record, only to be knocked out in the semifinals. Caps fans fear Alex Ovechkin, one of the best players to ever grace the ice, will go into the Hall of Fame having never led a team to the conference championship. 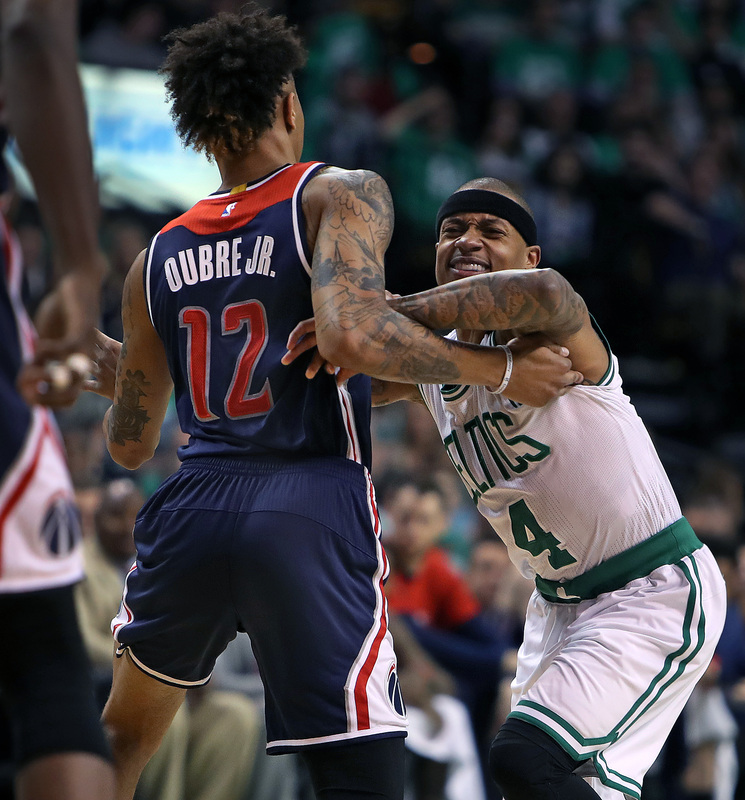 Celtics guard Isaiah Thomas (right) fights his way through the defense of the Wizards’ Kelly Oubre Jr. in the first half. The Boston Celtics hosted the Washington Wizards in Game 5 of the Eastern Conference semifinals at TD Garden in Boston on May 10. The Wizards lost in the first round 10 times in the past 38 years. Five times during that period, the exit occurred in the second round, and in the other 23 years the team didn’t qualify for the postseason. While the villain has been different each of the past two times the Wiz were knocked out (Indiana Pacers and Atlanta Hawks), the results were similar. Washington needs a victory in Friday’s Game 6 to avoid losing its third straight semifinal series 4-2. Matt Wieters of the Washington Nationals is swarmed by his teammates after hitting a walk-off two-run RBI single during the ninth inning to defeat the Baltimore Orioles 7-6 at Nationals Park on May 10 in Washington, D.C.
And whenever the Nationals have the best record in baseball (which is essentially every other year), they get knocked out of the playoffs in the first round, typically pushing the games to do-or-die, like the Capitals. One of the worst episodes in D.C. sports history has to be the 2012 NL Division Series, when the Nationals welcomed the St. Louis Cardinals for Game 5. Any sports fan’s stomach would have fallen to the floor witnessing the Nationals give up a 7-3 lead — at home — in the top of the seventh. Leading 7-5 with two outs and a full count against Yadier Molina, Drew Storen walked him in the ninth inning. Back-to-back singles helped put the Cardinals ahead to stay, 9-7. Going into Wednesday, the team from Charm City held a 2-0 series lead, beating the Nats in back-to-back games at Camden Yards. The Birds traveled down I-95 and were on the verge of going for the three-peat until Matt “Hello, darkness, my old friend” Wieters hit a two-run single in the bottom of the ninth against his former squad. So Washington didn’t strike out completely — pun absolutely intended — Wednesday night. But, being realistic: A regular-season win on a night in which both of the teams playing in the postseason lost just doesn’t stack up. A whole generation of fans in this city has never experienced a championship team. And it’s hard to see people be so jaded, so young. But going into a night like Wednesday, anything was possible, and even the most bitter D.C. sports fan allowed a ray of optimism to peek in. 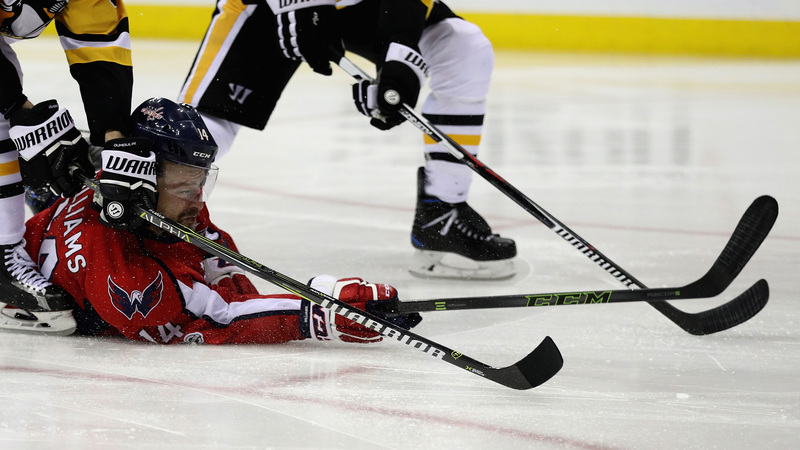 Emotions ran the gamut — jittery, anxious, excited, confident, fatigued, angry — and eventually the Capitals and Wizards checked their fans into the five-star Heartbreak Hotel. Take it from a Maryland fan: Burning things doesn’t really pan out all that great — especially if you need said burned-down venue for the other playoff team in town. Yeah, you really want to save that excitement for later in the postseason. Pulling for my @Capitals in tomorrow night's game 7! Can they do it? I say yes! If you believe in talking things into existence, then D.C. sports fans were doing a pretty good job of it Tuesday leading into the games. You may also subscribe to expecting the worse and hoping for the best, so the sting of defeat isn’t so great or so the satisfaction of victory remains pure. There’s no one right way to deal with your expectations for your team. The big day arrived. If all went well, it would feel like Christmas in the nation’s capital. If it didn’t, it would feel like ripping a Band-Aid off super prematurely and only making the injury worse. Washington's drought of 66 seasons since a pro team reached final four in its league is by far the longest active. #Caps can end it tonight. It's not even noon and my anxiety about D.C. sports tonight is off the charts. You could cut the tension in the proverbial social media air with a butcher knife if you felt so inclined. On that note, Stephen Strasburg was wearing a Capitals sweatshirt in the clubhouse before his start tonight. A prayer circle was formed by the professional and collegiate teams in the area to send well wishes and good vibes. Since '98 Stanley Cup Finals, the Caps/Nats/Wiz/Skins have been in final eight of their leagues 13 times. They're 0-13 in advancing. #Caps & #Wizards losing. Can we please just have 1 team or 1 year #DCSports? Please? 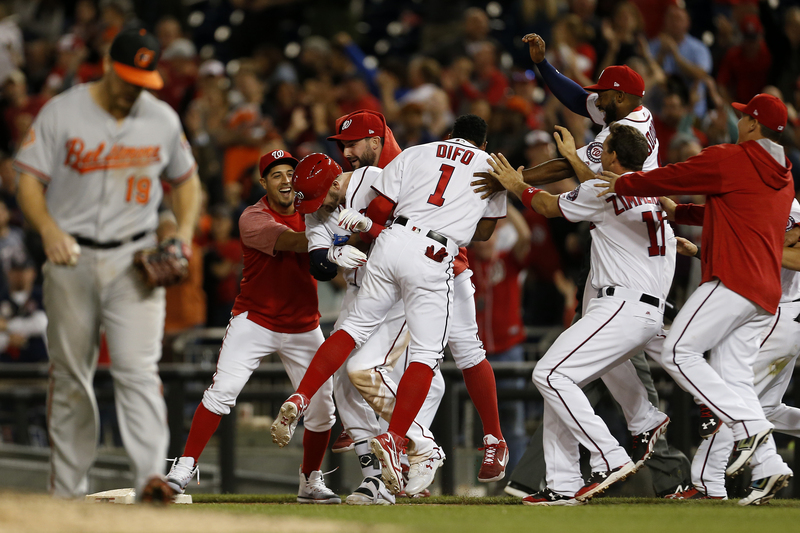 The only team in the #DCTrifecta to win tonight was the Nats…in a meaningless May game. D.C Sports Fans: "We just want one conference finals appearance"
Sports will never make me happy when it counts. Ever. Unfortunately for D.C. sports fans, the day after has not proved to be any better. As they are well aware, to the winner goes the spoils, and in this case the winner is social media, which is simply ruthless in situations like these. BREAKING NEWS: Mario Lemieux has been named owner of the Washington Capitals and the Pittsburgh Penguins. "The team honestly makes me drink." So Wizards got blown out and have to play 2 elimination games. Caps..Wizards…Nationals. Here in the DMV, we live in the Valley of Just Good Enough to Rip Out Your Scorched Graveyard of a Heart. Again. You can't just be DeathRowDC at home. You gotta take that on the road. This game was truly horrible!! This Story Tagged: Alex Ovechkin Bradley Beal John Wall MLB NBA … View All NHL Washington Capitals Washington Nationals Washington Wizards Washington, D.C.